Understanding project endings is a significant part of project management, yet there is relatively little work published in this important area. 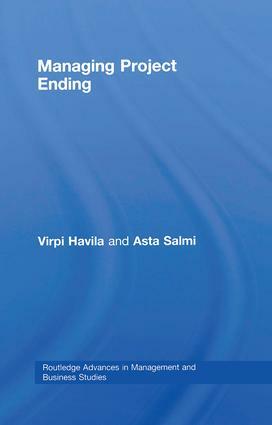 This book addresses the gap, focusing on the successful management of project endings, showing how to plan for the ending of a project, how to create ending competencies, and in particular, how to successfully manage relations with different stakeholders of a project as it is coming to an end. Havila and Salmi use a real-life case in the airline industry to show how the successful ending project was achieved and in doing so portray ideas and experiences not typically considered in the field. Through the case discussion, the complexity of the process is unveiled and the achievement of success for all parties is explained. The book portrays three key success factors: ending competencies, to be developed both at the organizational and individual levels; efficient management of the business network around the ending project; and involvement at the strategic managerial level. It concludes that project endings are often complex and have far-reaching effects, and therefore, call for close managerial attention.